Enter a world of fantasy, dark humour and a city of a thousand delights, but probably far more troubles that one would like to shake a stick at. If one had a handy stick. Hieronymus, our hero has been tasked with tracking down a murderer, and his path will lead him into the paths of many colourful and interesting characters. Not least of which are zombies, vampires, wanna-be-vampires and homesick puppies. (the last may not be entirely accurate.) 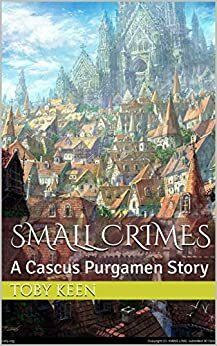 Welcome to the world of Cascus Purgamen. 3.0 out of 5 starsPlease get an editor...this is a great book otherwise. I quite liked this book, it is very Pratchetty..but it really, really needs editing...badly...which is a shame as I think that it would do quite well if you could just read it. I struggled through it and liked it so much I bought the other one. Just get an editor or a least read it before you publish and please may I have some more?